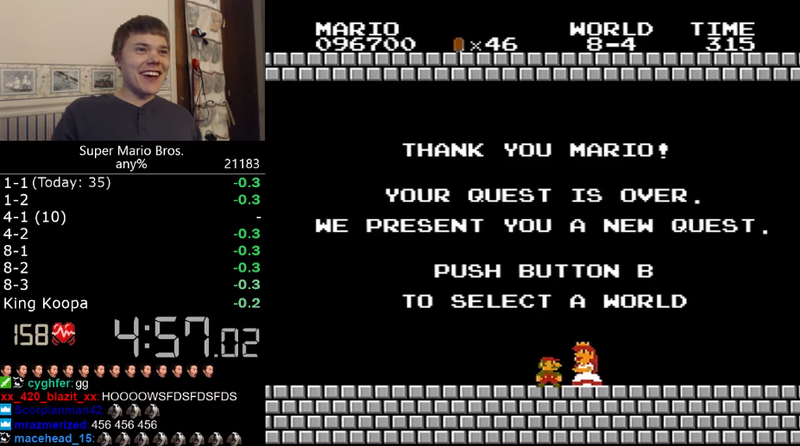 As late as 2013, the record for finishing Super Mario Bros. was held by andrewg1990 at 4:58. In April of this year, it was 4:57.427, and held by Darbian. Last weekend the record was tied by Kosmic at 4:57.244. He then broke it with a new time of 4:57.194. But only a few days later, Darbian reclaimed the mantle with a new record of 4:56.878. On that most recent record breaking run, you can see Darbian's heartbeat monitored in the lower left at the frame. It nearly doubles from 83 to 161 beats per minute by the end of the run. That's an incredible amount of stress to come out of a game that was released over thirty years ago. For most speedrunners, however, it's less about the game than about shattering the boundaries of what's possible. "The feeling at the end of the run was great — it always is when you know you've improved your best time," Darbian told me. "These are the moments that make speedrunning really special — seeing your hard work pay off." 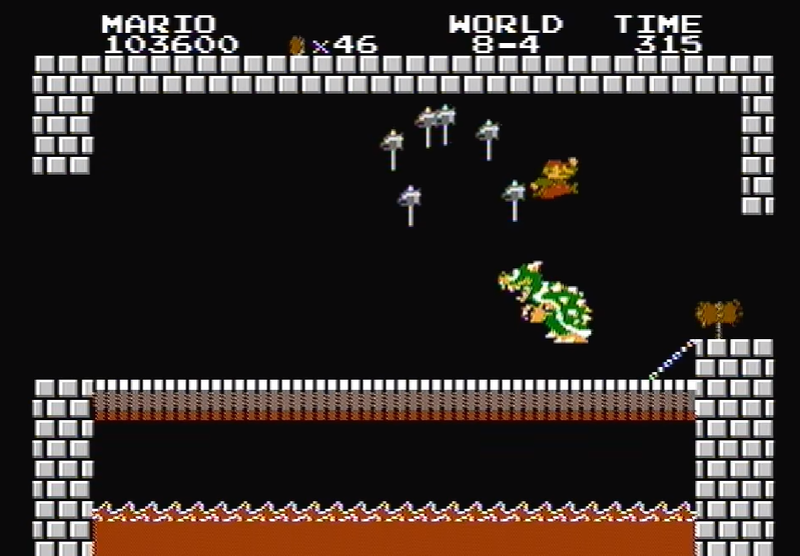 It took three years to shave half a second off of the best SMB speedrun back in April, but within the span of just a week, Kosmic and Darbian accomplished nearly as much. The reason has to do with a recent discovery made by a glitch-hunter called Sockfolder, known as the "flagpoll glitch." Kosmic continued, "It wasn't thought to be very realistic to pull off in a full speedrun, but Sockfolder wrote a program to find a setup that we have practiced and found quite viable. Since Sockfolder's discovery a couple weeks ago I've played the game for a few hours every day practicing and doing attempts." One of the benefits of this glitch is how early it occurs in the game. If Kosmic, Darbian, or another speedrunner fails to execute it, they can simply start over again without having wasted too much time. Other exploits, like a glitch on level 4-2, referred to simply as the "fast 4-2" are more difficult and include an element of randomness. "We're able to use [the flagpole] trick on World 1-1 and World 4-1 currently (the next level we would probably do this on is World 8-3 but we don't have a great setup for that yet)," said Darbian. "Not only does this trick add "easy" time to save to the run. In my run, I did 2 flagpole glitches to get 42 frames ahead of my previous best time, and then did a slower 4-2 strategy which resulted in me entering World 8 21 frames ahead (0.35s)." The breakthroughs that make these times possible are largely the result of tool-assisted speedruns (TAS) are fundamental to the modern world of speedruns. Beginning in the late 90s with Doom, the art of speedrunning as it's currently practiced entails finding the optimal path through a game with the help of an emulator and then trying to mimic that as a mere human. This makes SMB a perfect guinea pig for experiments like this in part because it has so few inputs. As a side-scrolling platformer, there's only so many things a player can do while navigating each level, making it easier to pin down the "perfect" way to traverse the game. But what would push someone to continue working at such a difficult and baroque task? I asked Kosmic what it felt like to break the record earlier this week. "The excitement was a combination of working at something for years and also the achievement of doing something better than anyone else ever had. Countless hours of practice and attempts came to fruition, so it was very rewarding," he responded. Having Darbian steal it back is less a disappointment than more motivation to continue. Instead of simply competing against what's possible within the logic of the game, Kosmic has a fellow traveller to inspire him on his journey. "Although we play separately and achieve records separately, speedrunners are like a team that works together to beat games faster and faster, Kosmic said. "Darbian and I have been voice chatting during many of our recent attempts and getting excited as either of us gets onto a good run. If nothing else it's motivating to have someone else to try and beat." For his part, Darbian doesn't think he'll be able to hold the world record for long. "[I expect Kosmic] to beat this time in the next couple of weeks - he's incredibly good at this game,"he said in an interview with Vice earlier this week. 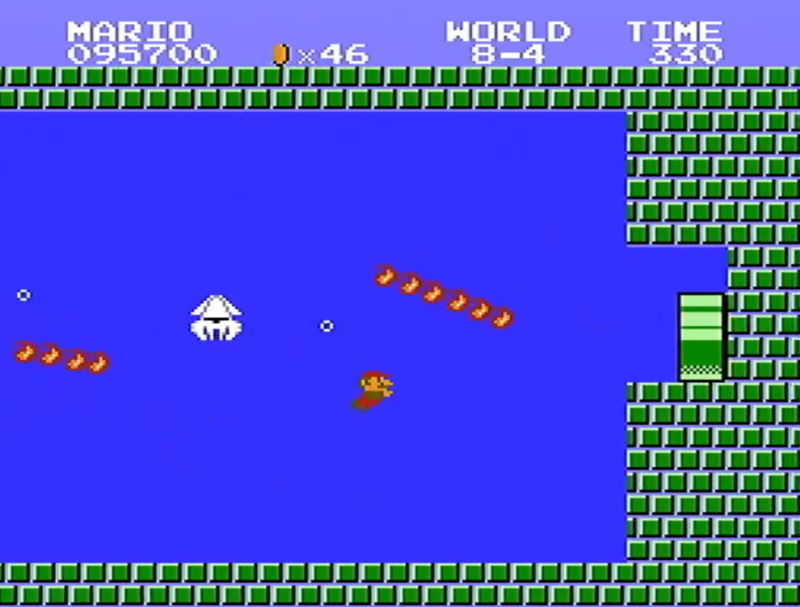 You can watch Darbian's most recent world record setting speedrun below. Darbian, Kosmic, andrewg1990 the former record holder, will be racing SMB in person at Awesome Games Done Quick in January. They are streaming for hours, talking about it explaining it, give play by plays and getting paid to do it. They are simply spending more time and sharing it with the wider community. Speed running was practice to reproduce a reliable spped for witnesses or an event... now its I can stream all my failings and upload the record breaker instantly.